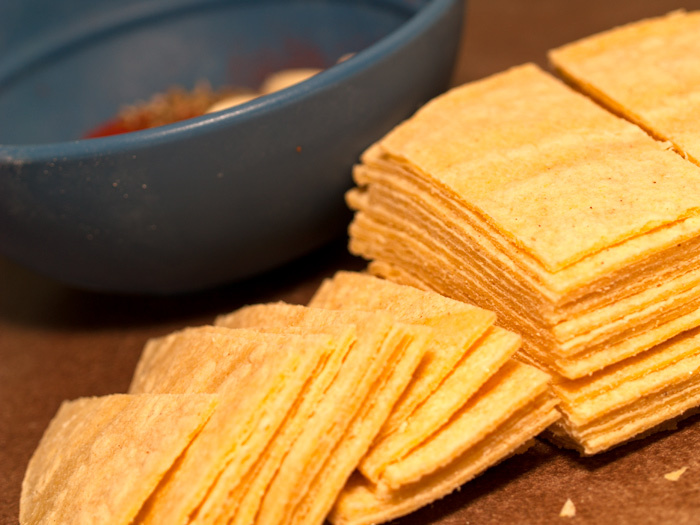 While making homemade tortilla strips for salads, I stumbled upon a method that reminded me more of a commercial corn chip than either fried or baked tortilla chips. By combining both processes and adding seasonings, one can end up with a nice snacking chip that would hold up to a dip or be flavorful enough to skip the dip completely. While the steps start with frying, only three tablespoons of olive oil is used in the pan. While any oven-proof pan can work, this process seems made for a cast iron pan, which also cleans easily afterward. I will note that these pick up moisture easily, so store in an airtight bag or container. This recipe lends itself to experimentation with various seasonings. Click here for a link to a printable recipe download.